.....Part 2:.. An Industry at an Inflection Point? .... Part 4: . Where and How Do We Make Money? .....Part 6 ....Robo Supremacism, Integration, or Something Else? Chicago, Year 2035. The people who own stock in U.S. Robotics Corp., whose headquarters forms a distinctive pinnacle in the Chicago skyline, are among the wealthiest people in America. The company is now introducing its latest line of NS-5 humanoid robots, one robot for every four American households. America is obviously in the process of becoming completely transformed by robotics. However, there is a dark side. U.S Robotics calls in a detective to investigate the murder of a robot scientist. Very shortly the detective begins to suspect the culprit to be a robot. ...And so the story goes in the sci-fi detective action adventure flick I, Robot released in July 2004. Actually the more sobering robot story has already taken place. Sony released its QRIO humanoid robot in Sept 2003. This is a lot more than just another cute and friendly “entertainment” robot. Not surprisingly, most Americans failed to notice, just like most Americans seem perpetually oblivious to their country's out-of-control debt growth and balance of trade deficits. The purpose of this paper is to provide an overall perspective regarding an incredibly vital and strategic emerging industry. Most mobile robot companies today are privately held, therefore hot stock tips will have to wait. But it is by no means too early to address more general questions. Does I, Robot create a misleading impression of the future “promise” of robotics? Where is robotics today? Where might it be in five to ten years? Where are businessmen likely to make money in this business in the near future? Since I believe that tech stocks specifically, and the stock market in general, remain overvalued with tremendous downside risk, and that we are headed towards a macroeconomic climate vastly worse than the stagflationary 1970’s –a climate likely to pulverize general bond and stock market indices- I continue to believe that one of the best places for stock investors to bide their time is in the precious metals area and other commodity-related industries. When the coming macroeconomic “Perfect Storm” finally blows over, which could be many years from now, lots of little robot companies will lie in the rubble like diamonds in the rough. Those who have been following the robot story will have no trouble jumping on this contrarian opportunity in the making. Even today, an individual may want to consider investing personal time towards a career or towards hobbies related to robotic development. The multi-colored areas of the graph that rise above the blue area depict expected growth in mobile robotics. The blue area depicts maturation in the fixed robotics area. This has been around since the 1970’s. Fixed robots are typically secured to a factory floor or gantry system and perform assembly line or warehouse distribution functions. In 2003 the annual fixed robot market was around $5 billion. Industry analyst Jim Pinto claims there are now more than 1,000,000 industrial robots in the world. (Add in mobile robots, and we are closer to 1.5 million total). The percentage of fixed robots building cars has dropped from 90% as of a few years ago to 50% of total robots. Mobile robots include 2,300 demolition robots, 1,600 surgical robots, 3,000 underwater robots, and as of Oct 2004 also includes over one million units of the Roomba vacuum cleaner, up from 12,500 sold in 2000. 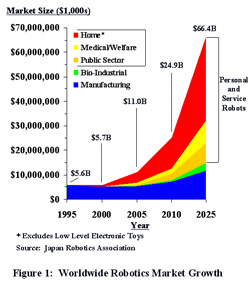 Dan Kara foresees sales of one million robots in 2005, and four million in 2006. The automation business could be undergoing a generational shift. The terms “mobile” and “fixed” echo in my mind a different analogy, namely William Lind’s analysis of the generational shift between Third Generation maneuver warfare and Second Generation “fixed” firepower-attrition warfare in the 20th century. I sense a historical pattern here where initially most "experts" will probably fail to grasp the significance of mobile intelligent machinery. The "robolution" will probably favor decentralized business initiative and decision-making. It will probably favor superior operational tempo, opportunistic exploitation of weak product-market segments, and bold moves that can completely obsolete competitor's products out from under them. Where I definitely do not want to draw an analogy involves the fact that modern war is typically at best a vicious zero sum game and more often than not is a massive net destroyer of wealth. Automation and ethical free enterprise capitalism are both supposed to increase wealth and provide win-win situations for everyone involved, to include competitors and society as a whole. (Sportsmanlike competition is supposed to enhance the socially useful division of labor and help people find the most productive use for their talents, not destroy them). More on the social aspects of the "robolution" later. Moore’s Law: Many computer industry observers expect chip processing performance to continue doubling about every twenty months. Each quantum leap in processing power for the same price (or offering of last generation capacity for half the price) has opened up whole new business areas. As an example, the ability to shrink the capabilities of a room full of computers in the 1970’s into an affordable desk top gave us the personal computer boom of the 1980’s, followed by spreadsheet applications, the Internet, and streaming video. Robots are voracious users of processing power for such purposes as navigation and mechanical coordination. Tasks that seem very easy for humans such as manipulating blocks on a table remain hard for robots. The human brain has remained so heavily geared by evolution towards physical coordination that ditch-digging seems easy compared to adding numbers, even though it consumes vastly more neural power. The chart below helps us visualize how continued growth in processing power, expressed as MIPS (Million Instructions Per Second) may correspond towards increasingly intelligent and autonomous robots. Michael Kanellos wrote in“Invasion of the Robots” that, "A 1,500-gram human brain can churn at about 100 trillion instructions a second, according to a paper recently published by Carnegie Mellon's Dr. Moravec--nearly three times the power of the Earth Simulator, the world's most powerful computer. Under Moore's Law, processing performance could increase to the point where machines can work almost as well as the human brain. `Better yet, sufficiently useful robots don't need full human-scale brainpower’ Moravec wrote in his paper. "Commercial and research experience convinces me that mental power like that of a small guppy, about 1,000 MIPS, will suffice to guide mobile utility robots reliably through unfamiliar surroundings, suiting them for jobs in hundreds of thousands of industrial locations and eventually hundreds of millions of homes.’"
“Bottom-up” driver: declining components costs. Other growth drivers will work in tandem with Moore’s Law. They relate to steady improvements in each of the various modules that make up robots while costs steadily decline. We have already seen declining industrial robot costs. According to a World Robotics Survey released in Oct 2003, the average cost of a robot in 2002 was only one fifth of the cost of a robot of similar performance in 1990. In the United States in 1990 an average industrial robot costs the equivalent of $115,000, the report said. By 2001 the price had dropped to $83,000. [Presumably the average robot of 2001 has superior performance compared to 1990 –author]. Prices in Europe were as low as $51,000. Elegant Japanese “entertainment” robots such as the AIBO and QRIO (described later) might suggest to many that the industry will mainly advance through the debut of flashy new systems. Instead, I believe that it is more likely that the evolutionary pattern for most American companies will probably involve applying incremental improvements in robot parts to achieve incremental business profitability. Many of the profitable niches will be highly specialized, unglamorous, and industrial in nature. However, the know-how and profitability achieved in these areas can provide vital stepping stones for more glamorous and comprehensive applications later. Gareth Branwyn’s noteworthy book Absolute Beginner’s Guide to Building Robots uses the following breakdown to help draw analogies between robot parts and human anatomy. Advances in one area can help free up bottlenecks and create cost-effective applications in other areas, and vice versa, in a kind of cascading effect. As a hypothetical example, an advance in laser geo-positioning navigation technology that enables a mobile robot to precisely find its way on a farm may take advantage of a previously unused four-legged walking technology for both mobility and planting seeds in uneven ground. An advance in a hand-like manipulator may take advantage of an unused visualization sensor technology to achieve a new capability to pick blackberries. The development of a new probe to check metal fatigue may take advantage of new propulsion systems that can crawl through pipes or over ships and planes. Redefined work concepts: In essence, mobile robotics is about bringing factory automation concepts out of the factory and into the outside world, to include our homes. A redefined work concept can create whole new jobs in new industries. As one example, in the 1800’s, improving the concept of the wagon as a mode of transportation to move goods and people overland through time and space went far beyond redefining the jobs served by horses, mules, and teamsters. It led to canals, and then to railroads, and then to air travel. As robots become more versatile and autonomous, I believe it likely that they will not only create new industries, but will multiply jobs for both themselves and for humans. (More on this issue in Part Five). Redefined product concepts. The first phase of fixed robotic development involved expanding the behavioral sequences of machinery on factory floors. On a conceptual level, these improvements were similar to augmenting the mechanical sequences of player pianos, washing machines, and dishwashers found in people’s homes. Fixed robots have generally had a very limited capacity to sense and move within their environments. The current phase of robotic development involves increasing the ability of robots to autonomously sense and intelligently interact on a mechanical level with their environments, both externally and internally. Existing machines can be made more robotic by incorporating within them devices that self-diagnose and mechanically fix their own problems. Sometimes a marginal improvement in the performance of a dated machine concept can make a big difference. The article, "Australian Scientists Develop the World's Largest Robot," talks about how roboticists inserted robotic controls inside a 3,500 tonne huge walking crane with a 100-meter boon. The crane's dragline reflected 1950's technology. The new controls "increased productivity of a dragline by around 4 per cent, which may not sound all that much - would save the typical Australian coal mine $3 million a year, or $280 million for Australia as a whole." This innovation is currently being marketed in the U.S. by P&H Mining Equipment as the Universal Dragline System. Some sample macro-demand factors: Germany has a 32-hour work week, and needs robots to offset high industrial labor costs. The US military needs robots to reduce casualties and supplement its all-volunteer force. Japan has an aging population that will need more care. In addition, the Japanese definitely do not want to import foreign workers. Almost every advanced industrial society has certain “pain points” that motivate government and private industry to subsidize or otherwise encourage various forms of robotic development. The fear factor: Societies are locked into global “value competition” (cf. the “value war” concept promoted by Advanced Competitive Strategies, Inc.). They must steadily strive to increase product quality while decreasing costs, or fall by the economic wayside. Retarded robotic implementation in particular, and declining automation in general, means declining economic, military, and political power. According to the Grandfather Economic Report, "The U.S. manufacturing base has declined from 30% of GDP in 1953 (when we had a trade surplus) to 13.8% in 2002." This has correlated with America's aforementioned rising trade deficits, skyrocketing indebtedness, and declining productivity. Dean Kamen, founder of the rapidly growing FIRST robotics hobbyist organization (For Inspiration and Recognition of Science and Technology), pointed out at the October 2004 RoboNexus convention that China and India graduate vastly more engineers than the U.S. (As a more recent update, the 2005 National Academy of Sciences study "Rising Above the Gathering Storm" reports on page ES-8 that in 2004 China graduated about 500,000 engineers, India 200,000, and the U.S. only 70,000). Kamen commented that: "The US needs to change its culture so scientists and engineers, not athletes, are heroes. [If it doesn’t] this country will continue to get what it celebrates.” He has added, "You have teenagers thinking they're going to make millions as NBA stars when that's not realistic for even 1 percent of them. Becoming a scientist or engineer is." The computer revolution has been about rapidly increasing processing power while continually reducing costs. The Internet revolution has been about repeating this pattern with the expansion of electronic information distribution. The robot revolution will be about repeating this pattern in regard to increasingly intelligent forms of physical labor. This will be especially true once robots become intelligent enough to design and build even more intelligent robots. We may see an interesting compounding and even acceleration effect. Robots will be able to download complex skill sets over the Internet, by wireless, or by other means. This may eliminate learning curve problems and set up times for complex tasks, allowing robots to adeptly switch back and forth between unrelated projects. Productivity could become astronomical by today’s standards. If the current pace of Moore’s Law continues, robots may become as smart as humans in twenty to thirty years. Imagine ten to twenty years beyond that, when the average processing power of autonomous robots might be a thousand times that of an average human or greater. Imagine that robots develop self-generative creative-analytical capabilities commensurate with their processing power. Imagine if we ask robots that are a thousand, ten thousand, or a million times more intelligent than us to design and build star ships. Imagine also that there are billions of them around to undertake this project. The veneer of civilization is thin, and the passions of man are many. A tug of war exists between those forces which favor the upward striving and ennoblement of man, and those that threaten to regress our societies back down to the level of the jungle. If the former win out, then interstellar travel may be closer to our lifetimes than many of us think.